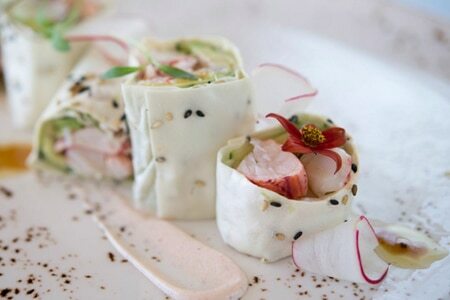 Modern seafood-centric cuisine at Balboa Bay Resort's chef-driven flagship restaurant. : This renovated and rebranded main restaurant of Balboa Bay Resort succeeds in providing guests with an inviting, approachable dining space. It’s still elegant: there’s outdoor patio seating and big bay windows that allow for watching boats jut around Newport Beach’s sparkling harbor while enjoying a selection from the solid wine list. But bright, colorful artwork and a lack of white tablecloths give its sleekness a progressive edge. The kitchen plays off this ambience with a thoughtfully designed seafood-heavy menu featuring fresh ingredients from trusted purveyors. Starters like ahi tuna crudo and grilled Spanish octopus with avocado, jícama and Marcona almonds are nicely prepared, while mains such as local white bass with bok choy, shiitake mushrooms, spiced peanuts and Thai curry sauce display smart creative touches. (Note: Vic Casanova is now Balboa Bay Resort’s executive chef.) Peanut butter cheesecake with grape sorbet is among worthy meal-enders. Drop by and partake of sandwiches and salads for lunch and expect a breakfast menu in the morning.